Perfectly vertical unit walls are a principal goal of careful archaeological excavations for they provide a clean side-view from surface to subsoil of the layers through which the archaeologist has excavated – an opportunity to scrutinize the associations between different archaeological contexts. These “side-views” are called profiles. For the last two weeks several teams have been preparing their profiles for photography and illustration. I have the pleasure of sharing their hard work with you in this post. 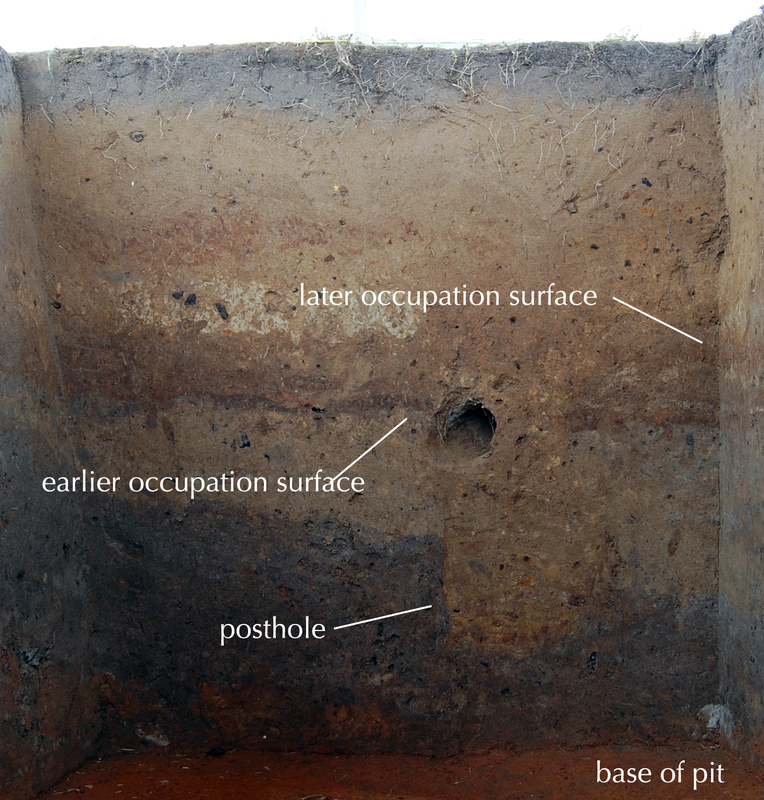 The neat profile photographs of Team 1’s wall trenches are key to meeting one of the principal goals of the MPP: confirming the relationships between certain magnetic anomalies and the architectural details of prehistoric buildings. For this reason, they excavated their units well into subsoil. 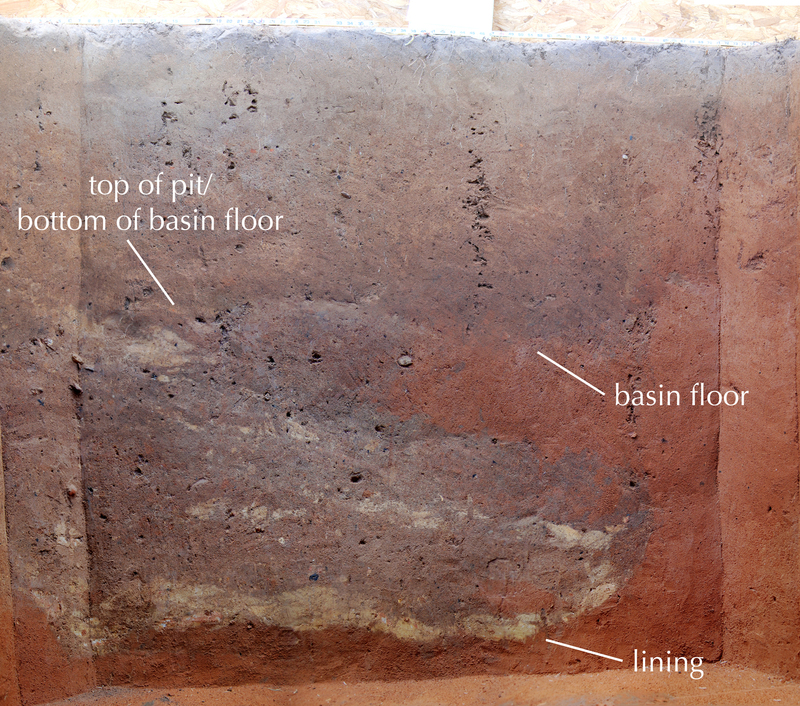 The profile of their 1-x-3 meter unit is especially informative, as it shows the sharp transition between the old structure’s sunken floor and the underlying subsoil. The wall trench is deep and narrow, too narrow, in fact, for substantial, rigid walls. Instead, they probably supported a “flex-pole” wall. 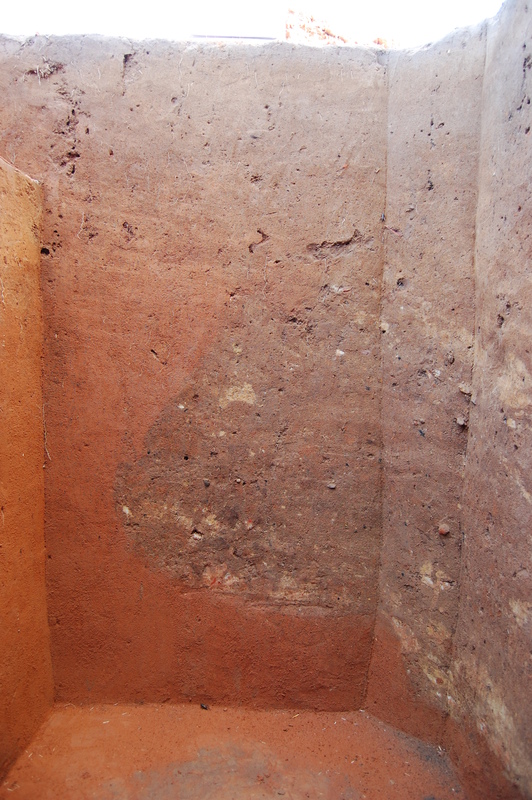 The tamped clay floor overlying red clay subsoil in the flex-pole structure. 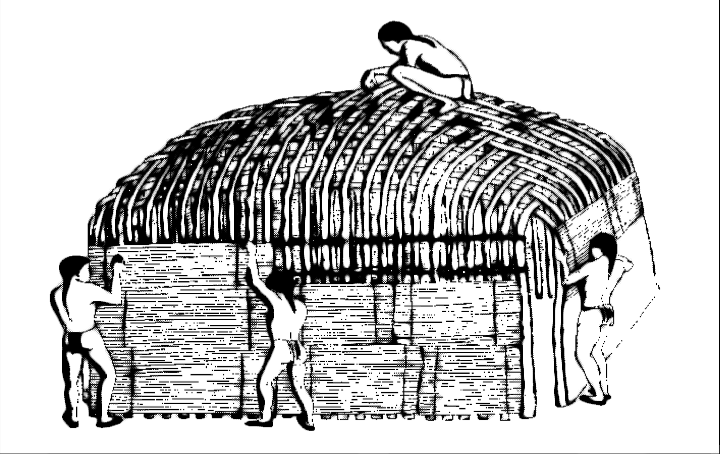 An artist’s rendition of a Mississippian flex-pole building. The magnetometer reveals that our flex-pole structure was far larger than this one, about ten square meters. 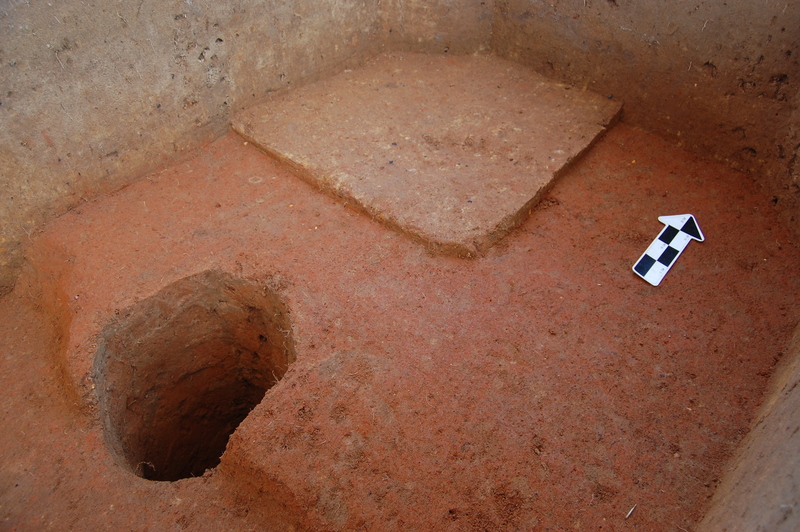 Team 2 bisected their 2-x-2 meter unit for the sole purpose of exposing the “bell-shaped pit” in profile. This was an especially important feature, given its rarity at the Moundville site. The profile reveals the precise shape of the pit, the layers of the deposits within it, and the darker soil of the overlying basin. Our interpretation of this feature as a bell-shaped pit is not as secure as it once was. Its shape is not quite textbook (see the pictures of West Jefferson bell-shaped pits posted under “Posts, Pits, and Ancient Buildings”): one side of the subterranean chamber is much more deeply undercut than the other and the floor slopes in that direction. This pit probably would have collapsed had it remained open for long. It must have been quickly filled after its creation. The thick yellow linings at the base and at intervals throughout are also a tad peculiar. We are considering other exciting possibilities that I may post here after further thought. Stay tuned! Team 3 completed their excavation of the refuse-filled pit that marks the edge of a large crescent-shaped, light grey anomaly within the larger “circular anomaly cluster.” If the crescent-shape represents the extent of this pit, then it is quite large, so large, in fact, that we may be dealing with a previously unknown “borrow pit.” Several borrow pits, usually filled with water, can be seen at Moundville today. They are locations from which mound builders quarried soil. The deposit exhibits subtleties that could not have been discerned had we not examined its profile. These include two occupation surfaces that appear as thin lenses of organic-rich soil. They tell us that the pit was, in fact, filled in over time rather than all at once.